Among the most noted of Lakeville landmarks was the Sampson Tavern which stood at the junction of Bedford Street and Highland Road in Lakeville. In 1911 it was described as "one of the most historic [houses] in this vicinity" and it was considered noteworthy at the time as "there are but few such houses in southeastern Massachusetts." The land on which the Sampson Tavern sat was acquired on July 8, 1768, by Uriah Sampson of Lakeville from Thomas Foster. Foster is believed to have operated an inn on the site, though little is known of this operation save for passing references in a few works. Uriah Sampson appears to have simply used the Foster house as a dwelling. Following the death of Uriah Sampson in 1790, his real property was divided amongst his sons, including Captain Elias Sampson (c. 1771-1847). The first written record of the house as a tavern dates to 1798 at which time Elias Sampson became an innkeeper and constructed an addition to the building. Elias Sampson's decision to convert the house to use as a tavern is not surprising. 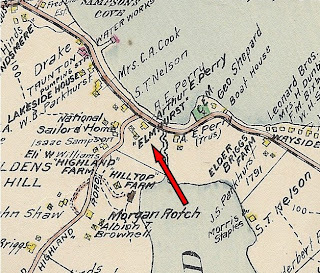 The building's location at the junction of the New Bedford post road (Bedford Street) and "the Beachwoods road" [sic] (Highland Road) made it a natural meeting place for traffic bound for New Bedford, Beechwoods and East Freetown. It has been stated that the tavern was initially known as the Eagle Tavern, and one of the eight elm trees which stood between the tavern and Bedford Street once held a standard to the top of which was attached a golden iron eagle. Adding greatly to the prosperity of the tavern was the construction of the New Bedford and Bridgewater Turnpike linking what is now Lakeville with Boston. The new roadway (now Route 18) was constructed following 1807 and provided a more direct and slightly less arduous route between Boston and New Bedford. Likely due to the prospect of increased traffic, the Sampsons operated a store in the north portion of the structure for a time. At the time, the stage journey between New Bedford and Boston took eleven hours, with a number of companies offering service. Watson and Gale’s stages left New Bedford on Mondays, Wednesdays and Fridays at 4 a. m., while those of Abraham Russell departed at 5 a. m. Additionally, Elias Sampson is said to have operated his own stage line which ran from a stable on Union Street in New Bedford to Boston. “The stages would arrive at Sampson’s in time for a substantial breakfast; returning they would reach the tavern about noon time.” To assist passengers in alighting, located “just in front of the house [were] the high brick steps, where the stage coaches drew up in the olden days.” In addition to passenger traffic, seven baggage trains consisting of merchandise and other general goods passing between Boston and New Bedford stopped at the tavern each week. The first stopping-place was at Sampson's Tavern, which had a beautiful location, looking out upon Assawampsett pond. The stop was for a change of horses, and to enable the passengers to have breakfast. The breakfast at the tavern was a famous feature, as, after a ride of fourteen miles in the cool, crisp air, over roads that were by no means smooth, the passengers had keen appetites. We had ham and eggs, beefsteak, sausages, potatoes, brown bread, biscuits, Johnny-cake, and buckwheat cakes and molasses. I will not say that these were all the things that were served, but I will say that it was a meal fit for a small boy or a king. Elias Sampson operated the tavern until 1821 when his son, Elias Sampson, Jr. (1799-1879), assumed management of the operation. 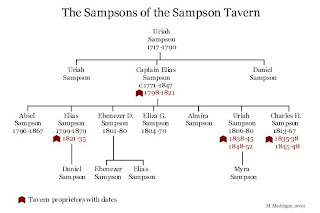 Following this, a succession of Sampson family members would operate the tavern until 1852. In 1830, Daniel Sampson joined the younger Elias as a partner in the operation. The two were succeeded in 1835 by two brothers of Elias: Charles H. Sampson (1813-67) a shoemaker who ran the business for three years from 1835 through 1838 and Uriah Sampson (1806-80) a farmer who maintained the tavern from 1838 until 1845. In that year, Charles H. Sampson, once more, took charge of the business, remaining in that role until 1848, when Uriah took his second turn heading the business from 1848 to 1852. Only in 1852 did the tavern leave the control of the Sampson family. Despite the ever-changing Sampsons as managers, it was Uriah Sampson who was foremost among the management of the operation and the one most closely associated with the tavern. In 1842, he acquired his brother Ebenezer D. Sampson's half-share in the tavern, at which time Uriah is described as an "Inn-holder". During the Sampsons’ ownership, the original structure was much added to and altered, largely as a result of growing business. “The first building was the central portion and was later extended to the south and to the rear. In 1835 the large north part was added. When completed it had two dining rooms, which, together, would seat 100 guests. There was a summer and a winter kitchen. The lower floor of the last addition was used to entertain large parties and for dancing. In the second story were nine fine sleeping rooms.” Rooms were lit by candles held in sconces which were mounted over the doors and windows and which remained present in the house for many years after they were made unnecessary. The tavern grounds covered a large area bounded by Highland Road, Bedford Street and the waterway which joined Lake Assawompsett with Long Pond. On the property were located three barns, one of which had capacity for thirty horses. In 1842, one structure was described as the "old stable", while just to the east of that stood a "new carriage house". Though Ebenezer D. Sampson retained the right to remove both of these structures from the property until 1848, it is not clear whether he ever exercised that option. Beautifying the grounds were eight stately elm trees which stood between the house and Bedford Street and which were said to have been planted in 1810 by Uriah Sampson. If so, this would have been Uriah Sampson, Jr. (1759-1849), the son of the original owner. These trees appear in later photographs as towering over the tavern. Sampson’s Tavern was the most prominent establishment in the vicinity, and a landmark known to all. In fact, the inn was used as a point from which to measure distances to other communities, such as New Bedford. Part of the notoriety of the tavern stemmed from the important social role which it played as a gathering place for the exchange of news as well as the site of numerous social functions. The tavern assumed a less publicized role when it sheltered a captured French naval crew in the early 1800s in order to protect them from harm. What stories the stage drivers told, in the bar room and in the barn for 30 horses: Of August suns beating down upon the roof of the coach, of the dusty, weary passengers within, of the thirsty, seating horses straining to reach the tavern at the breakfast hour. They told of wintery winds sweeping across the pond, of benumbed hands and aching feet; of snow-blocked roads, when the only approach to the tavern was on the ice at the edge of the pond; of the sad day when the coach broke through and the driver and a passenger were drowned. There was a brighter side to their story, for they told of the cordial daily greetings of Elias, Elias, Jr., Charles, or Uriah, proprietors through 54 years. They spoke of the pleasant days in May, or in the bright September weather, when they could hear their passengers chattering pleasantly together; making new friends, discussing the news of the day with their fellow travelers, as so graphically described to us by William W. Crapo. With a favored passenger beside him on his seat, the long road shortened and the driver’s task lost its sense of labor. The baggage wagon horses could have told the story: for them no trotting smartly to the tavern door for a quick exchange of horses, but of pulling heavy loads over the long sandy roads, urged on by cruel whips and harsh words, with only an occasional rest in the comfortable stalls of the tavern barns. These were the days when the tavern was full of guests, New Bedford was seeing prosperous whaling days and Sampson’s was the scene of many a frolic. The husking bees and the quilting bees of earlier times gave way to dancing and wedding feasts, there were skating and sleighing parties. Instead of the beads and wampum belts, and the wedding dance in the open air before the wigwams of the Indians; these dances, the men in broadcloth coats, the ladies in gowns of silk, ornamental with beads and rings of gold, lasted the long nights through, dancing the waxened floor, to the music of violins. A former bell boy tells of hurrying up the stairs, carrying refreshments to the guests, when one of the row of bells in the bar room rang; of setting pins in the bowling alley and of stepping nimbly aside when all went crashing down before a well directed ball; of the days when the circus halted there, the circus men, the trained animals and the horses, filling the tavern and barns, to the profit of the tavern-keeper and to the delight of all the boys around. There was rowing by moonlight on the pond; sailing parties were in vogue. To row over and see the Indians on the Indian shore was a never-failing entertainment for the tavern guests. The Indians would sell their brooms and ornamental baskets: dressed in native costumes they would show their treasures and their ornaments and boast of their ancestors. The Sampson Tavern was also noted gathering place for sportsmen. Massachusetts Senator Daniel Webster stayed at the tavern "while he followed his favorite sport, fishing on the lakes that abound in the vicinity." The tavern's proximity to Lake Assawompsett proved convenient for those like Webster who enjoyed fishing, and in September, 1853, Samuel Brown of the Namasket Gazette noted the ready availability of craft at the hotel to take fishermen onto the lake's waters: "The Sampson hotel's boats were moored in plenty, invitingly, near the way side, where they are generally in pretty good demand for the use of visitors. The hotel is in a fine rural location, and if it is kept, as it should be, free from liquors, and ample in accommodations, it must be a favorite resort of those who love good scenery, good air, and a quiet retreat." [“Tour to Lakeville”, Namasket Gazette, September 9, 1853, p. 2]. Hunting was also a popular pastime, with game such as fox, birds, and rabbits being eagerly sought. Others, however, came simply to observe the natural surroundings. Henry David Thoreau, in the company of his friend, New Bedford historian Daniel Ricketson, visited the tavern in 1855, curious to explore the natural and Native American history of the area. “Rode to Sampson’s in Middleborough” on a cloudy second of October Thoreau recorded in his journal. Undoubtedly, the naturalist and historian refreshed themselves prior to embarking upon the exploration of the Middleborough ponds. We reached the banks of the - Assawampsett, largest of this cluster of lakes, about, a half hour before sunset. A very picturesque and comfortable country tavern stands upon a neck of land between this and Long Pond, and here, my friend, who had frequented the spot for fishing, proposed to halt for the night. The number of gigs in the barn yard, however, and the quantity of young ladies and gentlemen promenading in the neighborhood, prepared us for the regrets of the landlord, (the writer's father), that he had not a bed disengaged. There were no less than three riding parties driven from the neighboring towns to Assawampsett to sail, fish, sup and pass the night and return in the-morning, and to their primitive pleasures we were obliged of course to yield feather and coverlid. A cup of tea, and a dish of fried pickerel was the landlord's offer in the way of consolation, and while that was preparing we mounted a hill in the rear of the house, from which the sheet of water on either side could be seen to advantage. The setting sun felicitously broke through at the moment of our ascent to the top, and showed us the panorama in gold. Probably it never appeared more beautiful. A single sail was on the larger lake but with that exception the two bodies of water looked like two breathless mirror dropped in the wilderness, and overshadowed on all sides by leaf-covered hills. It was a spot to stay in and explore. I cannot conceive indeed a more charming retreat than Lake Assawampsett would be for a, city family that wanted only comfort and boundless seclusion. Its tavern used to be the chief stopping place on the road between Taunton and New Bedford in, the days of stage coaches and it is a spacious old house buried in trees, its vocation somewhat staggered by the railroad, but its landlord genial looking, its surroundings ample and its bread and batter of an exemplary excellence. Our horse came around to the door with a willingness that was a reliable oatsometer and, satisfied that we had the six quarts duly generating power in our locomotive, we pushed off into the twilight toward Taunton. In 1852, Uriah Sampson sold the tavern to Joshua Gibbs 3d of New Bedford for $4,500 on behalf of Levi Newcomb, Jr., who was to pay Sampson over the course of the subsequent five years. Newcomb operated the tavern only for a few months, however, before Gibbs sold it to Abner C. Barrows. While most histories date Barrows' acquisition of the tavern to 1852, the conveyance was not signed until February 7, 1853. The operation, no longer owned by the Sampsons, seems to have entered a period of decline. The Namasket Gazette in 1856 noted that while the hotel had formerly "been a place of much resort for parties of pleasure ... of late years it has passed into other hands and is no longer attractive to visitors. This we consider as a public misfortune, and it is hoped that so beautiful a summer resort may at some not distant time be re-opened under new and more favorable auspices." ["The Middleboro Ponds", Namasket Gazette, September 12, 1856, p. 1]. Under the ownership of Barrows, the operation appears to have been known as the Assawampset Hotel, and it looked to cater to summer guests. 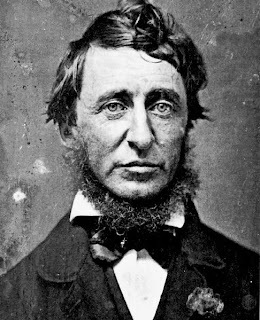 Barrows, like his predecessors, kept boats on the pond for the convenience of guests, and in October, 1855, Thoreau himself noted in his journal that "there was a good-sized sailboat at Sampson's house, now kept by a Barrows". In late 1857, Barrows sold the property to his future son-in-law Samuel P. Briggs (who would wed his daughter Clarissa in January, 1859) and Isaac Sampson, with the new owners taking possession at the start of December. Lest local residents be concerned of the fate of the establishment, the Gazette reassured "it is still to be kept as a public house." 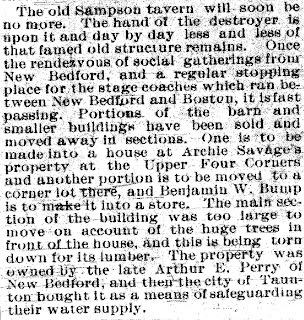 Briggs and Sampson appear to have operated the establishment as the "Samspon House", the name change undoubtedly being made in hopes of invoking the memory of the earlier Sampson Tavern. Additionally, the establishment was typically referred to as a hotel, the function of serving alcohol being done away with with the tightening of liquor laws which restricted its sale. Sampson remained in partnership with Briggs for only a short period. On December 1, 1858, he sold his share of the operation to Briggs for $275 and the remaining balance on two notes due to Briggs' father-in-law which were secured through a mortgage on the property. During Briggs' proprietorship, Thoreau's friend, Daniel Ricketson continued to frequent the tavern. Later in life, Ricketson would record that among the "sounds I particularly enjoy as associated in memory" was "the noonday song of the sparrow, known to me as 'the Sampson sparrow' from my having hears his pleasant song in former years at our old favorite retreat near 'Assowamset Pond'." In mid-July, 1859, Ricketson enjoyed an overnight stay at the tavern in the company of unexpected friends. [Sunday, July 17, 1859] Left home at 9 a. m., rode out to Sampson's. Soon after my arrival at Sampson's, while seated under the piazza, two gentlemen pedestrians came up from the northward who proved to be H. G. O. Blake and his friend Theophilus Brown, both near friends of H. D. Thoreau, having walked from their home, Worcester, and bound to the end of Cape Cod. The meeting was very agreeable to me, and I think also to them. After dinner we walked to the top of "King Philip's Lookout" and the west shore of Long Pond, where we bathed. A severe thunder-gust came up from the northeast about 7, which wrought in a few minutes the pond, a short time before calm and smooth, into a furious state, waves of considerable size dashing against the shore, and the sailboats dashing at their mooring as though they might swamp at any moment. It passed over to the S. E. in the course of an hour, and clear starlight suceeded, but warm and close air. Retired at 10, after a walk with Messrs. Blake and Brown by the shore of the pond. Slept in the S. W. room where I lodged last year. 18th, Monday. Clear, fine, and warm. Rose at 6 1/2, found my friends Blake and Brown already at their breakfast. After breakfast the landlord, Sam'l Briggs, kindly took his sailboat and went to the crossing place at Long Point for the purpose of landing Blake and Brown on their way to Wareham and thence to Provincetown, whom I accompanied; after a pleasant conversation on various matters during the sail, we parted with mutual good-will and farewells, they standing on the shore under the shade of the old oaks and waving their hats as we set sail, and so we parted after a pleasant interview of some hours. [Daniel Ricketson in Anna and Walton Ricketson, Daniel Ricketson and His Friends: Letters, Poems, Sketches, Etc. (Boston, MA: Houghton, Mifflin and Company, 1902), pp. 310, 311]. In the summer of 1864, George Thornton, "so long and favorably known to the travelling public as Baggage Agent at the Taunton Depot", was reported as having acquired the Sampson House which he proposed opening as a seasonal hotel, to be operated in the summer. Some circumstance appears to have intervened, for the next notice on record is the advertisement of the sale of the hotel "with or without furniture" in mid-August, 1864. Thornton, in fact, owned the hotel for but three short months from May 19 through August 15. Though it is not known what circumstance prompted Thornton to alter his previous plans so drastically, the hotel was immediately purchased by Henry G. Carpenter of Hixville in Dartmouth for $3,200 according to the title deed or $4,000 according to the local Gazette. Carpenter appears to have been somewhat "rough around the edges" if the tale related by Robert C. P. Coggeshall is any indication. Not only Carpenter's swearing, but his sharpness with his wife, offended a group of New Bedford men investigating a water supply for that city. Among them, were a number of Quakers, or Friends. Mr. Carpenter had been previously commissioned to provide a dinner for the party at his tavern in Lakeville, bordering on Assawamsett pond. (This was later the Eben Perry place.) He took great pains in providing an attractive spread. After the entire company were seated at the table, a silence came over the group out of respect to a number of Friends who were of the party. Just at this moment, Mr. Carpenter, who was standing at the opposite side of the table from the kitchen door which was open, yelled in stentorian tones to Mrs. Carpenter, who was within the kitchen, inquiring in language strongly emphasized by profanity, what she had done with the chicken fixings and other things. The effect was that of a bomb. George F. Kingman says that he immediately grabbed Mr. Carpenter and told him to stop all such talk. Some were terribly shocked, others amused. It is said that one good Friend lost his appetite with that blast, but my good friends George F. Kingman and David B. Kempton always declared that it had an appetizing effect upon them. [R. C. P. Coggeshall, "The Development of New Bedford Water Supplies", Old Dartmouth Historical Sketches No. 42, 1915]. Nor did the earlier admonition by Gazette editor Stillman Pratt that the hotel avoid dispensing hard liquor appear to have been heeded by Carpenter. In April, 1866, "State Constable Morse of East Bridgewater, and Dep. Sheriff Kingman of Bridgewater, [made] a raid in Middleboro and Lakeville, and on Thursday, Mr. Carpenter of the Sampson House and Prince Penniman, were arraigned before Justice Pickens for violation of the liquor laws. They were both found guilty, fined and sentenced." At the time of the building's demolition in 1912, there still remained in the attic a secret hiding place for liquor. It was "a secret cabinet hidden behind a slide that is moved only by pressure on a spring". 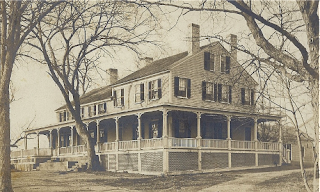 The tavern ceased operations in 1869 and the following year, on June 28, 1870, the property was acquired by Josephine (Mills) Perry, wife of Eben Perry of New Bedford, who transformed the former tavern into a summer home. Work was conducted in the summer of 1871 on the property, at which time it was reported that "the old Sampson Hotel which is now occupied by Eben Perry of New Bedford as a summer residence, is being renovated and improved." [Old Colony Memorial, "The County", June 1, 1871, p.2] The home would later be known as Elmhurst from the large elm trees which shaded the property. Later, the house was occupied as a summer home by Perry's son, Arthur E. Perry (1857-1909). The younger Perry was an attorney, who had been educated at Friends' Academy, Providence, and Harvard. Perry studied law in the offices of Marston & Crapo of New Bedford while attending classes at the Boston University Law School. Admitted to the bar in 1879, Arthur Perry was employed in the office of Crapo, Clifford & Clifford before establishing a practice in partnership with Hosea M. Knowlton, known as Knowlton & Perry and still later as Knowlton, Perry & Cook. 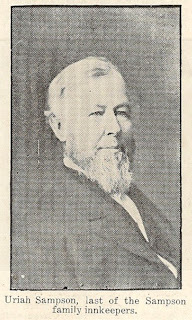 During this period, Perry was prominent in New Bedford political circles, serving as both a councilman and an alderman for a number of years. Declining health prompted Perry to retire from his practice about 1908. 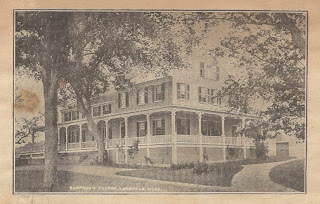 Perry enjoyed the summer estate at Assawompsett with his wife, Susan (Rawson) Perry whom he had wed in 1897, and became a prominent seasonal resident of Lakeville. In 1903, largely through the influence of Perry, the Lakeville Public Library was founded. During the winter of 1908-09, Perry spent time at Lakeville "in hopes of regaining his health", but following a decline in his health which confined him to his New Bedford home, Perry died in March, 1909. An inventory of his estate filed with the Bristol County Probate Court following his death valued his Lakeville estate at $12,000. 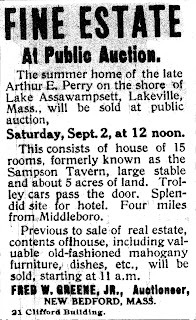 In 1911 the Tavern property was advertised for sale at auction scheduled for September 2. The New Bedford newspaper reporting the proposed sale noted that it was one of the few transactions worth noting at the time. "As to New Bedford the week that has just passed has been the dullest of the summer with the real estate trade." "Previous to the sale of the property the valuable antique furniture stored in the house was placed on sale and brought good prices. Mayor Ashley of New Bedford was one of the buyers and he secured a quantity of old furniture." One piece associated with the tavern, Uriah Sampson's tall-case grandfather clock now resides prominently in the lobby of the Lakeville Public Library, a gift to that institution in 1947 from Sampson's grand-daughters. Ultimately, the property was acquired by the City of Taunton which sought the parcel for water resource protection purposes. The City had no interest in the historic structure, and so demolished it. The old Sampson tavern, a landmark for years, has been demolished by the water department of the city of Taunton which recently acquired the property. The lumber has been disposed of to parties who are to use it in erecting houses and it is stated that but $200 was received from this source, this leaving Taunton with only the land for the amount paid for the property, about $5,000. 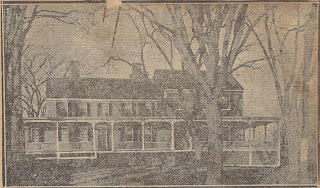 ["Lakeville", Middleboro Gazette, January 12, 1912, p. 5]. Among the items salvaged were some of the stone steps which Sidney T. Nelson rescued for use in his bungalow then under construction on Court End Avenue in Middleborough. Today, little tangible evidence remains to remind visitors of the Sampson Tavern. The Shaw Park at the junction of Bedford Street and Highland Road contains a set of the tavern's granite steps, as well as a memorial to the Sampson Tavern which was dedicated in 1996. Nonetheless, a visit to the park during an early summer evening as dusk descends over Lake Assawompsett remains a magical experience just as it must have been for the owners and guests of this Lakeville landmark over a hundred and fifty years ago. Sampson Tavern memorial, Shaw Park, Lakeville, photographed by Michael J. Maddigan, May 20, 2006. Uriah Sampson (1806-80), halftone from Elmore P. Haskins, "Sampson's Tavern", Old Dartmouth Historical Sketches No. 51, (New Bedford, MA: Old Dartmouth Historical Society, 1921), p. 28. An 1851 guest in the hotel described Sampson as "genial looking" and this photograph bears out the characterization. The Lakeville Public Library has an oil portrait of Sampson in his younger days which may be viewed in the Brian H. Reynolds Local History Room. "Fine Estate at Public Auction", advertisement, Middleboro Gazette, September 1, 1911, p. 4. Middleborough Public Library. "Lakeville", Middleboro Gazette, January 12, 1912, p. 5. Middleborough Public Library. Sampson Tavern steps and memorial, Shaw Park, Lakeville, photograph by Michael J. Maddigan, May 20, 2006. The steps are located to the northwest of the actual site of the tavern which stood closer to the wetland area beyond the tree line. R. C. P. Coggeshall, "The Development of New Bedford Water Supplies", Old Dartmouth Historical Sketches No 42 New Bedford: Old Dartmouth Historical Society, 1915. William W. Crapo, "A Trip to Boston in 1838", Old Dartmouth Historical Sketches No. 40 New Bedford, MA: Old Dartmouth Historical Society. Elmore P. Haskins, “Sampson’s Tavern”, Old Dartmouth Historical Sketches No. 51. New Bedford, MA: Old Dartmouth Historical Society, 1921. New Bedford Standard-Times, "Old Timepiece Given to Lakeville - Grandfather's Clock Goes to Library", November 3, 1947. Old Colony Memorial, "The County", June 1, 1871, page 2. Anna and Walton Ricketson. 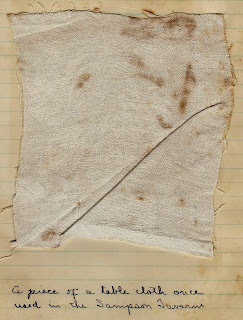 Daniel Ricketson and His Friends: Letters, Poems, Sketches, Etc. Boston, MA: Houghton, Mifflin and Company, 1902. Henry David Thoreau, The Writings of Henry David Thoreau: Journal VIII, November 1, 1855 - August 15, 1856. Bradford Torrey, ed. Boston: Houghton Mifflin and Company, 1906. Gadzooks! Amazing post. Chock full of information. How do you find time to do such thoroughly researched articles.